Using sound masking as a design platform. With the WELL movement gaining momentum, many organizations are increasingly focused on providing building occupants with speech privacy and improving their acoustic comfort. Background sound is critical to achieving those goals. Indeed, all acoustic design considers that factor—for example, when determining sound transmission class or speech privacy class, as well as when calculating articulation index or signal-to-noise ratio. However, building professionals often fail to recognize a sound-masking system—the only accurate means of controlling the background level—as a design tool. 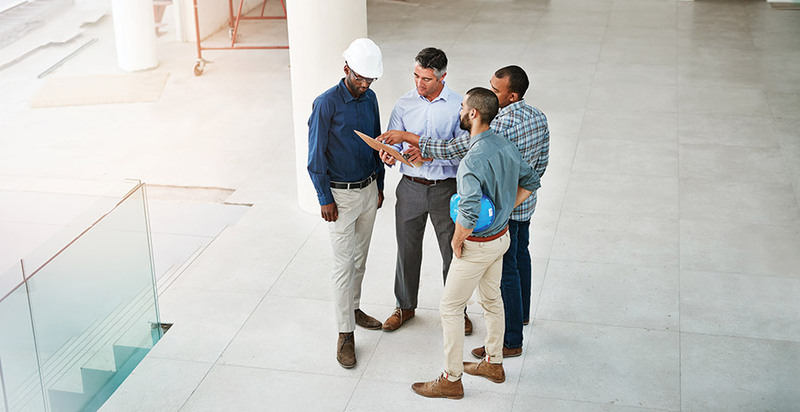 Consequently, facilities are planned according to a worst-case scenario, which leads to over-specification of physical construction, increased costs and reduced flexibility, with unpredictable acoustic results nonetheless. If masking is used in these projects, it’s only within limited areas—usually the open plan—or post-occupancy, when other strategies appear to have failed. 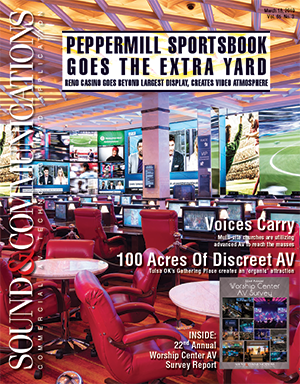 Those in the AV industry have the opportunity to marry their systems expertise with architectural criteria in order to highlight the value-engineering opportunities afforded by a more integrated approach to acoustic design—one that uses controlled minimum background sound to achieve the desired goals. A precisely and reliably delivered masking sound is essential to that approach. HVAC levels vary by zone, as well as at certain times of day or year. Furthermore, such equipment does not generate a sound spectrum designed for speech privacy. However, ASTM E2638 also frequently reminds readers SPC is only valid at the time it is measured, because the background noise is presumed to be derived from the HVAC system and, therefore, it’s highly variable. Even when well designed, this equipment’s output is governed only insofar as it’s not to exceed certain maximums defined by the American Society of Heating, Refrigerating and Air-conditioning Engineers (ASHRAE) in the 2013 ASHRAE Handbook—Fundamentals. It has no means of controlling the minimum. Levels can vary by zone and, at certain times of day or year, they can vary by 15dBA or more. In some cases, different heating and cooling strategies are employed in the exterior and core, resulting in even more variable acoustic conditions across the space. If chilled beam systems are used, the overall level will be dramatically lower than traditional HVAC. Whenever and wherever the background sound falls below the 30dBA on which STC ratings—and, hence, wall choices—are based, occupants can no longer rely on the partition assembly for speech privacy. Walls only address part of the acoustic equation. Speech privacy also relies on the background sound at the listener’s position being higher than the residual signal that penetrates the structure. Furthermore, HVAC systems do not generate a sound spectrum conducive to speech privacy. Instead, the sound generated is largely arbitrary, and it varies considerably from space to space, as well as over time. Similarly, despite having the same STC ratings, walls isolate different frequencies depending on their design and assembly. 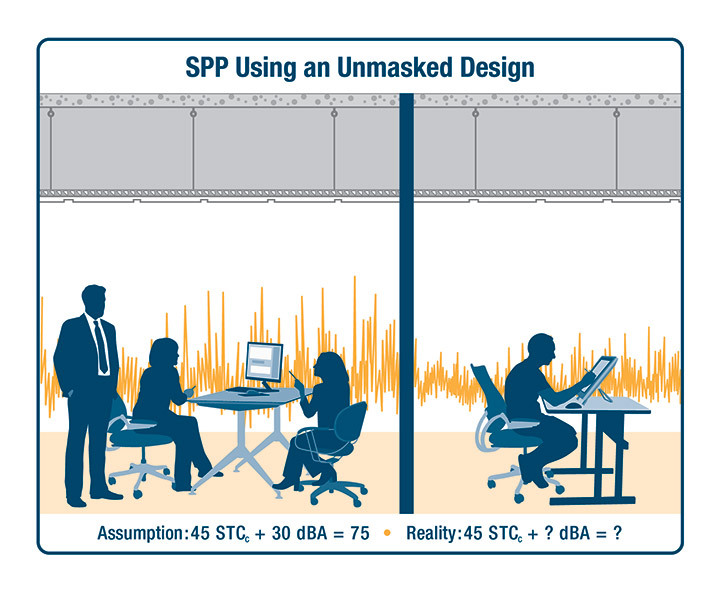 Consequently, speech-privacy levels fluctuate from wall assembly to wall assembly, depending on their performance in the frequencies used to calculate STC, while also fluctuating because of the inconsistent noise level and spectrum generated by the HVAC system—not to mention sound leakages through various flanking paths. If privacy is achieved, it’s mostly due to either good luck or overbuilding. If not, a sound masking vendor is typically contacted. Alternatively, sound masking, when used as the starting point for interior planning, lets building professionals set the base level of background sound throughout the facility and, hence, allows them to specify more accurately the blocking and absorptive elements used in their design. In other words, this controlled minimum level becomes the canvas on which the rest of the acoustic plan is painted, allowing it to be delivered in a more cost-effective manner and with greater assurance of the intended result being achieved. A design that does not feature sound masking but that, rather, relies on HVAC to provide an assumed minimum background sound level leads to over-specification of the room’s physical structure while, nevertheless, leaving its actual acoustic performance up to chance. 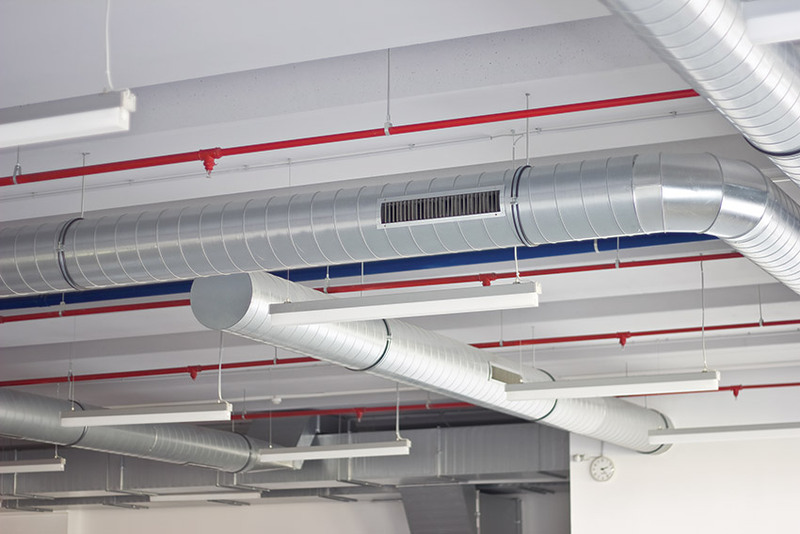 A sound-masking system distributes a sound similar to softly blowing air, causing many occupants to assume HVAC is its source. However, unlike HVAC, the sound is continuous and professionally tuned to meet a particular spectrum—or “curve”—engineered to balance acoustic control and occupant comfort. Considering that sound masking has been available since the late 1960s, one might wonder why the building community has yet to embrace it as the foundation for interior planning. To understand the delay, one must consider the technology’s history. 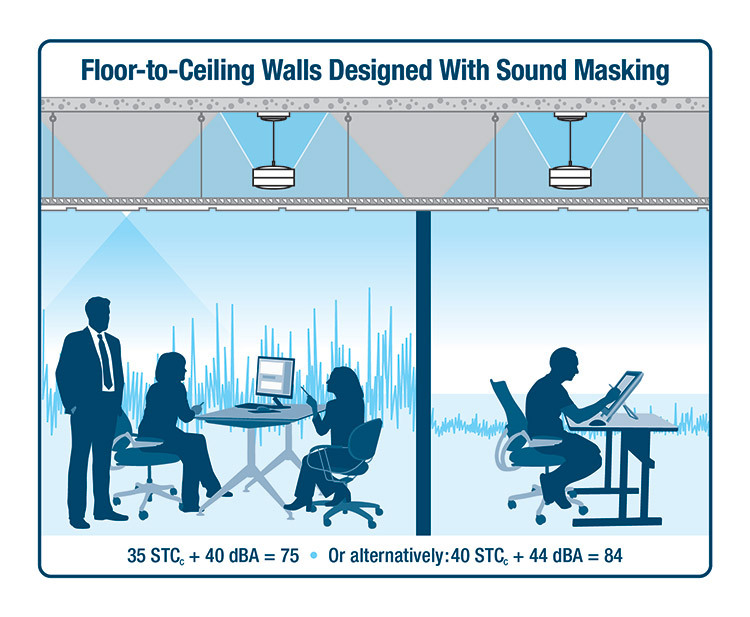 A design that utilizes sound masking to establish a known minimum background sound level—even as low as 30dBA—as well as a spectrum or “curve” designed for speech privacy, eliminates the variability of HVAC sound. This allows acoustic goals to be more reliably achieved with the stated STCc. Sound masking was first adopted to help with the obvious acoustic challenges encountered in an ever-growing number of open-plan spaces. That initial application led some to conclude that it was only intended for those areas—an opinion reinforced by a significant technical impediment. Early systems used a centralized architecture, which is very limited in its ability to offer local control over the masking sound. Zones containing large numbers of loudspeakers spanned numerous private offices and other closed rooms, with little opportunity to adjust the volume within each space (i.e., simply via 3dBA transformer taps) and no ability to adjust for frequency. The resulting inconsistencies in volume and spectrum impacted the sound’s performance and occupant comfort, leading both vendors and dissatisfied users to conclude it could not be applied to closed spaces. 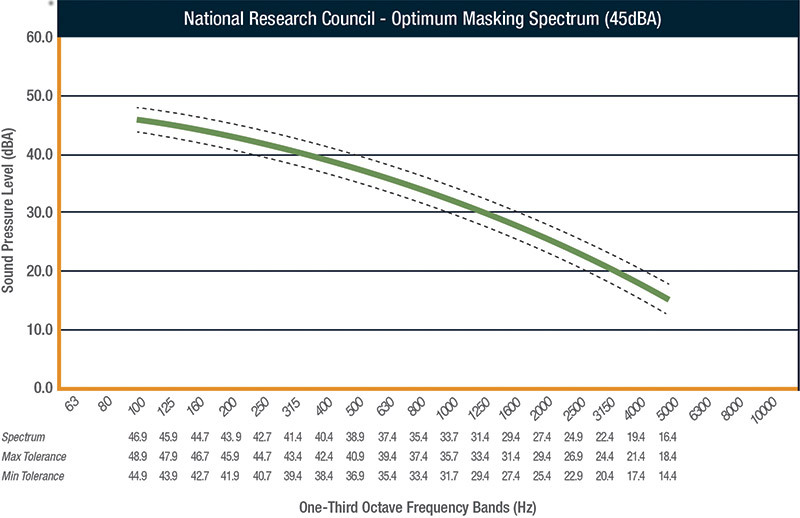 The National Research Council’s (NRC) optimum masking spectrum shown at a level of 45dBA, as well as one-third octave band tolerances of ±2dBA. 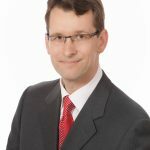 Advances made in sound-masking technology—particularly the decentralization of sound generation, volume and frequency control, as well as the introduction of computer auto-tuning—mean minimum background sound level is now a readily deliverable component of architectural acoustic design. ASTM E2638 expresses SPC as the sum of LD(avg) + Lb(avg), where LD is average reduction in source level at the listening position (i.e., transmission loss) and Lb is the average background sound level at the listening position. While preparing “Sound & Vibration 2.0: Design Guidelines for Health Care Facilities”—the companion document to the Facility Guidelines Institute’s (FGI) 2014 Guidelines for Design and Construction of Hospitals and Outpatient Facilities—acousticians simplified the formula, declaring that, “to achieve confidential speech privacy, the sum of the composite STC [STCc] and the A-weighted background noise level [dBA] shall be at least 75,” or STCc (+) dBA ≥ 75. The STCc metric includes the negative impact on acoustic performance when elements such as doors and windows are added to the partition. If the background sound level is set to 35dBA, rather than 30dBA, STCc can be lowered to 40. Alternatively, using a still-moderate level of 40dBA permits STCc as low as 35, even while maintaining a speech privacy potential (SPP) of 75. Some refer to this revised method as speech privacy potential (SPP) and, indeed, it does provide a basic predictive model for achieving speech privacy in closed rooms. As dBA is assumed to be 30, STCc must be at least 45 to achieve the combined total of 75. Using sound masking to apply a continuous level of 30dBA eliminates the variability of the source, and speech privacy is more reliably achieved with the stated STCc. The curve generated by a well-designed and professionally tuned masking system is also precise; therefore, the speech privacy it provides is greater than the typically erratic spectrum produced by HVAC equipment, even at the same volume. However, in this scenario, it’s important to note the sound is set to a level far below that used in traditional masking applications. Leaving a range of adjustment “on the table” provides two additional advantages—cost savings and flexibility. Further value engineering and site flexibility can be achieved by building walls to the suspended ceiling, rather than to the deck. With STCc at 35 and the masking level reliably set to 40dBA, SPP is 75. If the STCc is increased to 40 and the masking level is raised to 44dBA, SPP is 84. If speech privacy equals STCc (+) 30dBA ≥ 75, then, for every 1dBA increase in the background sound level, it is possible to reduce STCc by one point and achieve the equivalent level of speech privacy. Were the background sound to be increased from 30dBA to 35dBA, for instance, construction costs for partition types would start to drop significantly because the STCc could be reduced by five points. Again, 30dBA—and, indeed, even 35dBA—is well below typical masking levels in closed rooms. Usually, they are set to between 40dBA and 43dBA in such spaces. Depending on various factors, including occupant comfort, they may be set higher. Therefore, although 30dBA can be used as a design benchmark, the lowest STCc rating possible to achieve an SPP of 75 is actually determined by the highest comfortable level of continuous minimum background sound. Although the established maximum levels for HVAC can form the basis for the controlled minimum background sound provided by the sound-masking system, there are significant opportunities for further value engineering because the predictable overall volume and spectrum allows one to reduce the specifications for the room’s physical shell. With a suitable design of sound masking, walls and ceilings, it’s also possible to achieve privacy with walls built to the suspended ceiling, rather than to the structure. That affords additional cost savings and flexibility. When sound masking is incorporated into the facility design, one also has the opportunity to increase the background sound level if the partition construction fails to live up to its rated level—for example, as a consequence of common deficiencies, such as flanking paths—but remedial action would be cumbersome or costly. Although the minimum planned level should be at least 30dBA, as noted, the level traditionally recommended in most closed rooms is 40dBA to 43dBA. That leaves a range of adjustment at the facility manager’s disposal. Of course, that rationale can also be applied to existing spaces that aren’t performing as expected. 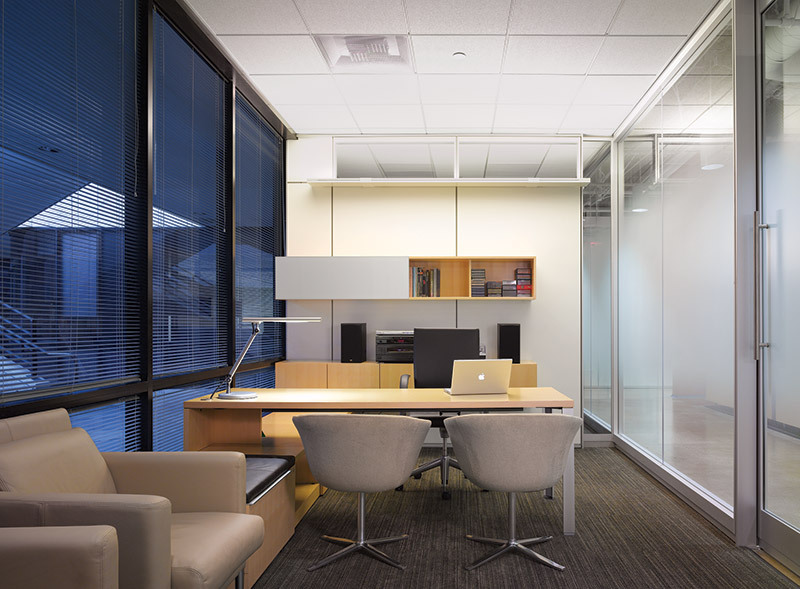 However, by waiting to install masking post-occupancy, an organization forgoes the opportunity to reduce construction costs and the specifications for other acoustic treatments. It’s important to note that integrated acoustic design of this type is only viable when the minimum background level is precisely generated and consistently delivered by the sound-masking system. Variations in spectral quality can have similarly negative effects. Therefore, it’s incumbent on those responsible for acoustic planning to ensure the sound-masking system is designed and implemented with due consideration for these stringent requirements. A poorly designed or improperly tuned system can allow as much as 4dBA to 6dBA variation; that means the system’s effectiveness is halved in unpredictable areas within the facility. For example, having a large zone (i.e., more than three loudspeakers or 58m2) connected to one set of controls limits one’s ability to adjust the system’s output to meet the specified curve in each closed room and ensure the same masking spectrum is applied throughout the facility. If large zones span multiple private offices and/or meeting rooms, it also prevents one from adjusting the level to suit occupant preferences and needs. To maximize control over the sound, provide each closed room with its own loudspeaker(s), allocated to its own control zone. Each zone should offer precise output adjustments for both volume (i.e., 0.5dBA increments) and equalization (i.e., third-octave over the specified masking spectrum, which is typically from 100Hz to 5000Hz or higher). Lastly, although occupants can be given control over the masking volume within closed rooms—for example, using a programmable keypad—the system should prevent them from setting it lower than the minimum level established for speech privacy within the facility. Following installation, tune all treated areas at ear height (i.e., where occupants experience the masking effects) and provide a detailed report of the results. Although outdated specifications still in circulation might permit a wide tolerance (i.e., up to 4dBA), a well-designed and computer-tuned system can keep variations in volume to ±0.5dBA and variations in frequency to ±2dB per third octave, providing dependable coverage throughout an installation. Although acoustic professionals have always advocated the ABC Rule of absorbing, blocking and covering unwanted noise, listing “C” last reinforces the notion that it’s a final consideration and perpetuates the misplaced emphasis on isolation and absorption strategies when designing for speech privacy. Instead, the approach should be CBA: cover, block and absorb. By using sound masking to define and, therefore, know exactly what the background sound level will be anywhere in a facility, one can more accurately specify the remaining materials. Further, the volume can be increased later if more acoustic control is needed or desired—a flexibility that this technology uniquely affords. 1 Many acousticians prefer to use ASTM E1130, Test Method for Objective Measurement of Speech Privacy in Open-Plan Spaces Using Articulation Index, for both open and closed spaces. When calculating the level of speech privacy, E1130 also considers the combined effects of transmission loss due to the partition assembly and reduced signal-to-noise ratio (SNR) due to the background sound level. 2 See this author’s “Exploring the Impacts of Consistency in Sound Masking” in Canadian Acoustics, 42(3), 2014.